Every year, I blog on my birthday. It helps me look back over the past birthday posts to see where I was, and realize what an amazing year it’s been – and then I think about how I’ll look back next year and be even more amazed. I started and completed the first part (Bachelor’s degree) of a Metaphysical Ph. D program with the University of Sedona. I also started realizing some deep, spiritual things about life. That’s the biggest part for me. My studies, and introspection, have led me to understand that there is a true essence of who we are. This true essence is not our thoughts, not our feelings, not our bodies. It’s not our experiences, or even our gifts and talents. All of those are like clouds- they pass along. What stays? What is underneath all of that? The part that’s left is the part that I am when I’m offering Reiki to another person – because that’s the part that connects us all to each other. It’s not a part, really, it’s the real me. Bigger than any perception of individuality. I know this because from a deep, spiritual place of knowing, comes the understanding that Love is what heals. Love is what soothes. Love is what we are when we’re doing and being our very best selves. A few months ago, I woke in the morning with the words, “Live Love” in my mind. I turned those words over and over. The real me is Love, so that’s who should live AS me. This Love, it’s infinite. I started to think of a design. An infinity sign, with the words Live Love entwined at the “v”. I sketched it out, and sent it to a graphic artist. It stung a bit, but didn’t hurt as much as I was afraid it might. I have also been applying Reiki liberally to help it heal, along with the other care instructions my artist gave me. 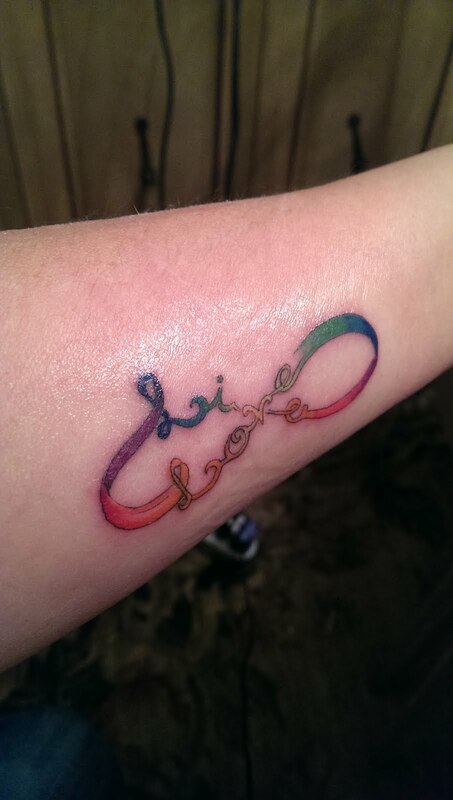 Something even nicer is that my husband, Evan, got his first tattoo too. He got an OM symbol, chosen for the same basic reason – because he meditates, and the word OM represents the sound that is all things – the infinite. This is his own way of expressing it. We both got tattoos placed a couple inches below the wrist. And we did it together. So we’re sharing another bonding experience – and I love that.